Orion Expedition Cruises, the leading operator of five-star expedition cruising in the Australasian region, has been named Best Responsible Cruise Operator at the internationally acclaimed 2010 Virgin Holidays Responsible Tourism Awards which took place as part of World Travel Market in London on Wednesday 10th November (World Responsible Tourism Day). Thousands of tourism organisations and travel experiences were nominated by the public in just 13 categories with the central tenet being that all types of tourism – from niche to mainstream – can and should be operated in a way that respects and benefits destinations and local people. These prestigious awards recognise individuals, companies and organisations in the travel industry that are making a significant commitment to the culture and economies of local communities and are providing a positive contribution to biodiversity conservation. Commenting on Orion Expedition Cruises' award, the judges said: "Orion Expedition Cruises is the only cruise company with Earthcheck certification, and shows a real commitment to the communities it visits. By acknowledging that authenticity can only be realised for their guests by working in partnership with communities, they conduct community research ahead of establishing new ports of call - helping protect cultural heritage and environment while offering real benefits to the places they visit. They have influenced suppliers to make positive changes like moving from plastic containers to cardboard and aluminium bottles over plastic. Cruise is a growth area and this small operator is one to watch." 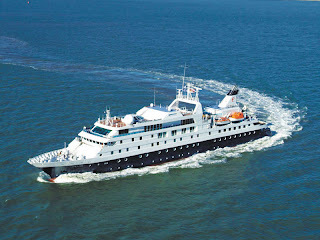 Commenting on the award, Sarina Bratton, Founder and Managing Director of Orion Expedition Cruises, said: "The destinations visited by Orion have some of the most pristine and sensitive wilderness areas on our planet, with little or no infrastructure to support visits by hundreds of people at one time. Understanding this, we have a social responsibility to develop a marine tourism blueprint that is sustainable, one that is at the forefront of eco-sensitivity and a benchmark for internationally recognisable and environmentally sound operating practices. For Orion, sustainability is more than a fashion, a trend or a compelling need. Sustainability is a core component of our company's originating vision and values. To explore "a path less travelled" requires a gentle step. To work with the challenges and opportunities these environments offer is the starting point of every journey." Founded in early 2004, Orion Expedition Cruises has developed voyages to encourage guests to become a part of the region they are discovering. It is a unique product that appeals to both local and international travellers alike: people who seek the mental stimulation of new experiences, places and discovery, whilst enjoying the comfort of luxurious surroundings. Orion Expedition Cruises operates the 106-passenger expedition vessel Orion in the Kimberley region of Australia, the East Coast of Australia, Papua New Guinea, New Zealand and the Sub Antarctic Islands, Melanesia, the Spice and Forgotten Islands and Antarctica. In May 2011, Orion Expedition Cruises will increase the size of its fleet with the addition of a second specialist expedition cruise ship, Orion II. Based on thorough research, and following the success of Orion's recent voyages, Orion II will be based in South East Asia offering a wide range of expeditions that will include Vietnam, Thailand, Cambodia, Borneo, the Inland Sea of Japan and the Russian Far East.